"Ask the Boss" is a FREE discussion forum focused primarily on the management and enjoyment of privately owned recreational ponds and lakes. Register, post and participate. Navigate through forum topics and be amazed at the depth of knowledge, kindness and helpful ways of our members. This site is strongly moderated by a group of amazing people, as well. An aeraspace engineer from Ohio, a natural resources attorney from Mississippi, a world-class angler who supports his fishing habits with a thriving dental practice in Nebraska, a retired IT headhunter in Texas, an international entrepreneur from Pennsylvania, a pond managing microbiologist from Ohio and a seemingly perpetual fisheries student temporarily in Arkansas... they all ride herd on everyone who posts. Any unfriendlies are quickly dispensed and escorted from the site. Even your sixth grader can scroll through this forum without worry. Go ahead, pick a topic and take a look. ...the "Ask the Boss" forum was originally an idea for Pond Boss website followers to be able to speak "live" with fisheries biologist Bob Lusk? Yep, that's how it got started. Founding editor, Mark McDonald, came up with the idea back in 1997. His vision was, every Thursday evening, for Bob to come onto the website, live. Visitors could type a question and Bob would answer it immediately. Everyone on the site could see the exchanges and participate. It didn't happen for several reasons. Lusk was still raising five kids and Thursday evenings were fairly busy, McDonald was a writer, not a techie. Lusk was a fish guy, not an Internet guru. Al Gore wouldn't return phone calls to help with his invention, so Pond Boss leaned on webmaster J.P. Greeson. J.P., who founded the Texas Fishing Forum and was glad to help. He introduced Pond Boss to the latest, greatest forum software and helped start "Ask the Boss" in 1998. But, after a couple of years, the forum began to fill up. So, the webmaster upgraded software and migrated the old posts over. Then, two years later, in 2002, the site slowed down, the software was again outdated and chewed up bandwidth, so he completely changed software and started over. 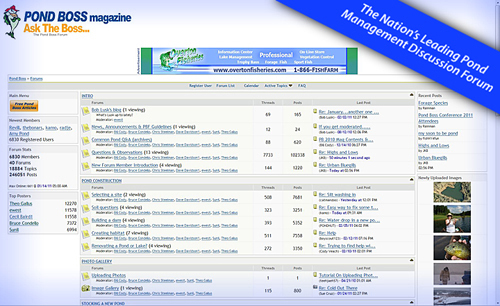 The forum you see began in 2002 and has upgraded software several times. Today, it is still the leading discussion forum on the entire Internet for all things pond management.